RUSH: Ves in Toronto. Ves, great to have you with us. I’ve never been to Toronto. I’ve always wanted to go. CALLER: Gorgeous city. We’d love to roll out the carpet for you, Rush. I want you to know that there’s many, many Canadians who love listening to you because we understand that without a strong America, there’s no free world. So God bless you, my friend. RUSH: I appreciate that. Thank you very much. RUSH: Why were you stunned? RUSH: Well, not on the university campus it’s not. CALLER: Yeah. Well, standing ovations galore. He all but told people to vote Obama, but what strikes me is that no one complained about that, absolutely no one. You heard no Democrat complain about Russian interference or collusion. And it seems to me that that’s hypocrisy at its best. RUSH: That’s an interesting take on it. I met Gorbachev in Houston. It was at the 80th birthday party for George H. W. “Poppy” Bush. And it was at the ballpark there. I can’t remember the name of the baseball park, but, anyway, it was there, and James Baker introduced me to Gorbachev. And he had the same old translator that was with him from back in the eighties when he was running the Soviet Union. He was having the greatest time. He was the biggest buddy of George H. W. Bush. I mean, they were close buddies. And he was there the next day when H. W. did his parachute trick out the airplane. Gorbachev standing out there looking up at the sky shading his eyes and applauding like a school kid when Bush landed making the parachute jump. So Gorbachev has some connection to Houston. But I’m not through here. 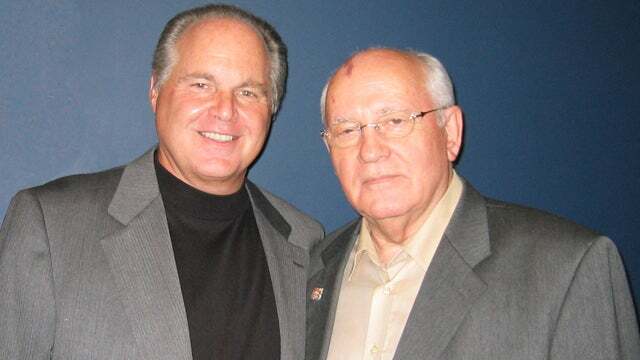 RUSH: Gorbachev was on campus at a university in Houston (I’m not sure which university he specified) urging 1500 students to vote for Obama and against Romney. Why isn’t that Russian collusion? Well, in the strict sense, Gorbachev is not an official from the Russian government — that we know of. He could well on the spy payroll, but we don’t know. But as such, as a nonofficial government representative, it’d be a tough case. But that’s not the question. The question is: Here is the former leader of the communist Soviet Union — who regrets what happened there — urging students to vote for Barack Obama. Now, the media did its best to sanitize Gorbachev and make it look like Reagan posed the greatest threat to world safety and that Gorbachev was the big savior, but it’s the other way around. It’s the exact other way around, and it’s an example of what… We talk about Russian interference. You can’t have any more successful infiltration of the American college campus than that example. Our caller from Toronto was stunned to see ’cause it because it’s Texas, and Houston, oil economy. You associate that with superior capitalism and so forth. But not on campus.